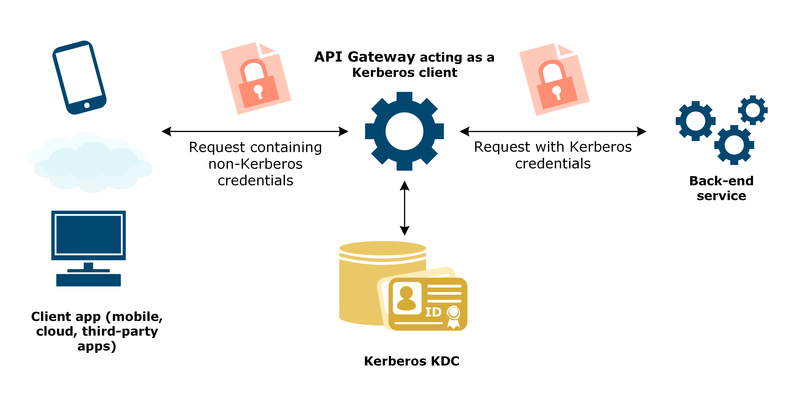 If a non-Kerberos client application must connect to a back-end service requiring Kerberos authentication, API Gateway can act as a Kerberos client and mediate the authentication. Client application: Does not support Kerberos authentication. Back-end service: Requires Kerberos authentication, but not the end user's credential. API Gateway: Acts as a Kerberos client and authenticates to the back-end service as itself. The client application can only authenticate using some non-Kerberos authentication mechanism. The back-end service requires Kerberos authentication, but does not need to authenticate the real user associated with the client application. API Gateway sits between the client application and back-end service, and authenticates the client using a non-Kerberos authentication mechanism. The back-end service authenticates API Gateway as the Kerberos client, and trusts that API Gateway has authenticated the real user. In this example, the Kerberos client ClientGateway connects to an existing back-end service. You can use the example names, or replace them with names of your own.